Shannon and Justin were married at the Fort Lauderdale Marriott Harbor Beach Resort & Spa. The Ft. Lauderdale Marriott is a great spot to have a wedding with many amazing locations for great wedding photography. We captured this photograph long after the couple's Ft. Lauderdale beach wedding, and well into their wedding reception. After the party started the couple wanted to take more photos around the Marriott property. We took them over to the pool area. 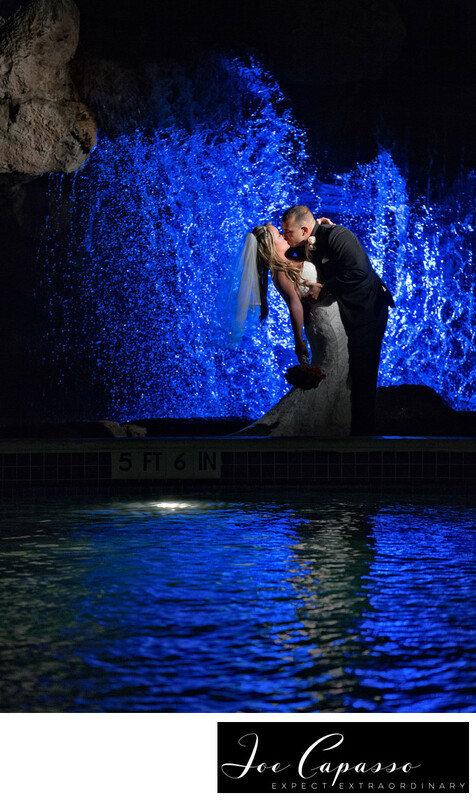 We used several lights to light up the waterfall at the pool. Joe Capasso photographs weddings often in Fort Lauderdale and Miami. Location: Fort Lauderdale Marriott Harbor Beach Resort & Spa, Ft. Lauderdale, Florida. Keywords: Fort Lauderdale Marriott Harbor Beach Resort & Spa (3), ft. lauderdale wedding photographers (3), ft. lauderdale weddings. fort lauderdale wedding photographer (3), Marriott Harbor Marriott (3), Marriott weddings (3), Miami Marriott Weddings (3).